Area 4-5 is the fifth course of Warped Mansion and the thirty-second course overall in Mario vs. Donkey Kong: Mini-Land Mayhem!. 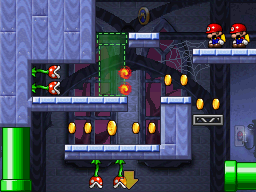 The Mini Marios begin on a platform on the top right, with the exit door in the bottom right. In order to reach it, the Mini Marios must utilize the Green Pipes in the area while evading Piranha Plants and their fireballs. The M-Token is located on the top left, atop a Green Pipe entrance on the upper level. To collect it, the Mini Marios must enter a down-facing Green Pipe simply by following it from their starting position. The Mini Mario Card is located on the bottom left, in an alcove just above the exit door. The Mini Marios must simply fall down to it upon collecting the M-Token. This page was last edited on December 23, 2018, at 19:18.